Cupheas are perennials that produce bright orange, red, yellow or purple flowers all summer and fall. Some species are called cigar plants due to their tubular, cigar shaped flowers tipped in red or yellow (like a lit cigar). Others are sometimes called firecracker plants because their cylindrical flowers are bright red or orange (looking like a firecracker). By any name, their nectar-filled, tubular flowers are widely known for attracting large numbers of hummingbirds, butterflies and bees. In addition, young stems of some species are reddish, further adding color and contrast to the usually narrow, lance-shaped green foliage. As a group, cupheas grow best in full to part sun (the brighter, the better) and well-drained, moderately fertile soil. Cupheas are drought tolerant once established, but grow faster and larger with regular moisture and occasional fertilization. Their origins in warm climates allow them to thrive in heat, but likewise make some species sensitive to cold winters. Those that are frost tender along the Gulf Coast are best placed in a sheltered location in the garden. Cupheas are pest and disease resistant and are not invasive in Florida. They are not truly deer resistant, yet reports suggest cupheas are not favored by deer. Cupheas are great summer performers in bright, hot and dry locations. Flowering begins in summer and continues through fall until short days and cool weather reduce flowering or frosts cause dieback. Along the Gulf Coast, cool winter weather slows them down, so re-growth doesn’t occur until mid to late spring, and flowering usually doesn’t begin until days and nights are warm. Growth and appearance of many cupheas are improved if plants are pruned or cut to the ground in late winter. Over 200 species of Cuphea are native to Mexico and the warm-temperate and tropical Americas. Of these and their hybrids, the cupheas listed below are great summer-flowering perennials for the northern Gulf Coast. 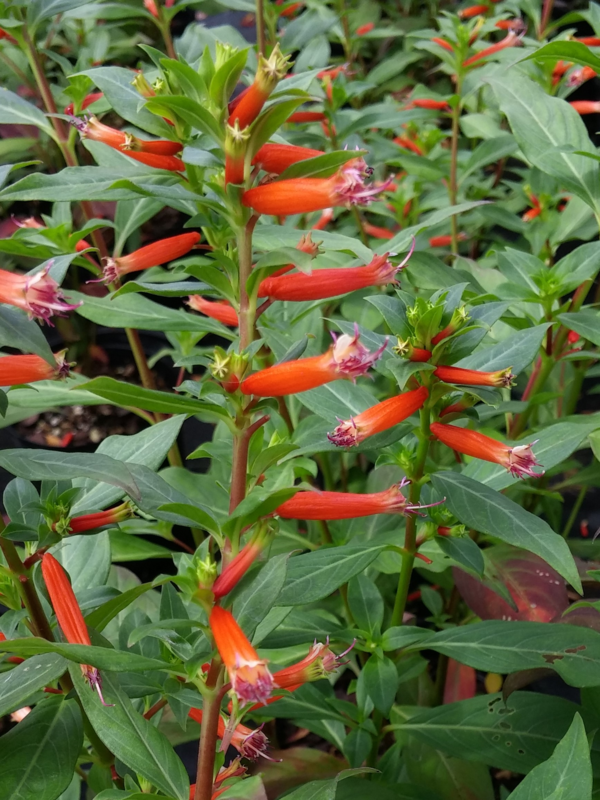 This fine-textured plant produces red to orange tubular flowers about an inch long. This cigar plant is hardy to about 20°F. 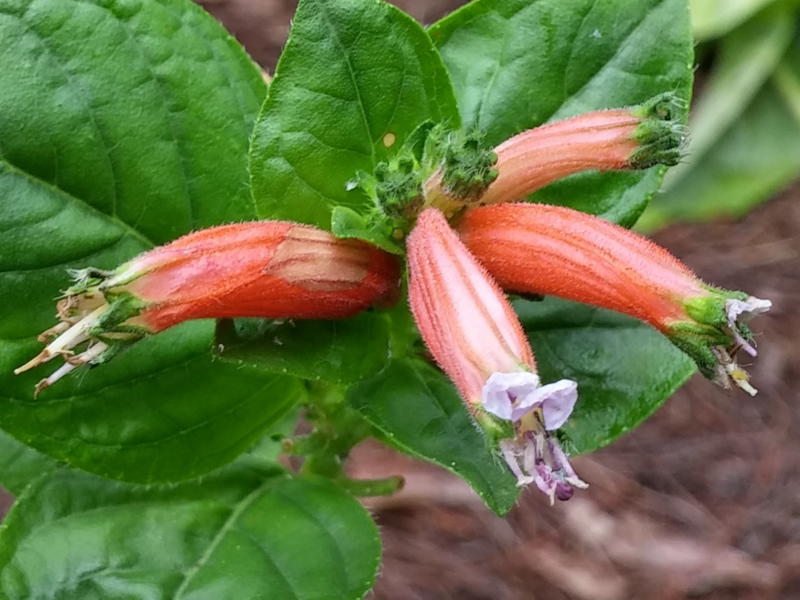 It grows about 2 feet tall and 3 feet wide along the Gulf Coast, though it would be a larger, evergreen shrub in warmer climates. 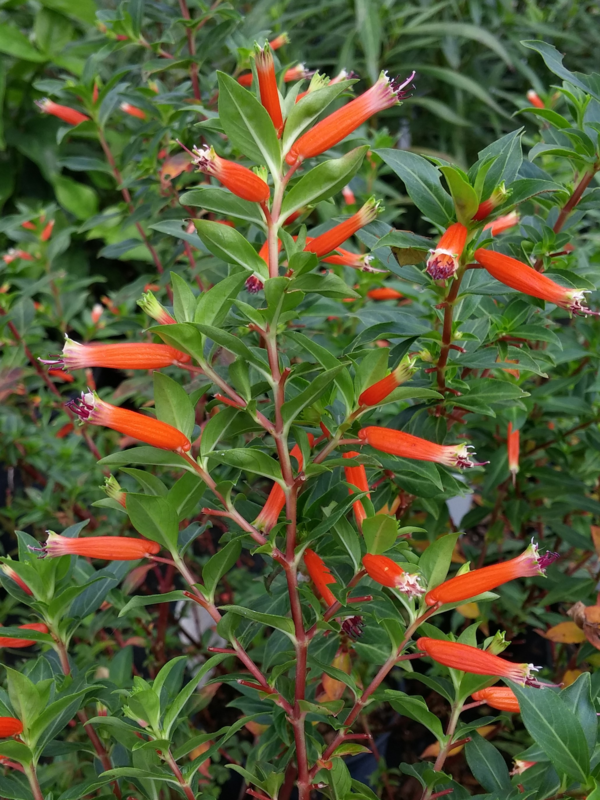 This cuphea tends to have lanky growth, so occasional summer pruning will stimulate branching which results in more dense growth. Flowers are 1.5 inches long, emerge pale yellow and gradually turn orange from the base upwards, offering a colorful, two-tone effect. Foliage is hardy to 25-30°F and this cigar plant is root hardy to at least 15°F. Stems should be cut back to ground level in late winter to keep the plant tidy. Clumps spread slowly outward by rhizomes, and the plant will reach 3 feet tall and wide along the Gulf Coast. This sprawling, floriferous cigar plant prefers moist, well-drained soil to thrive. Barrel-shaped, 1- to 1½-inch blooms are orange and yellow and sometimes have small purple petals at the tips. Flowers cover the branch terminals in the heat of summer and into fall. This plant is hardy in Zones 8 to 9 (at least down to the mid 20s°F). Unlike many other cupheas, leaves of orange cigar plant are oval- to heart-shaped. Stems grow 2 to 3 feet tall and readily flop or fall over. Plan to give orange cigar plant lots of room to sprawl through the garden! This floriferous hybrid produces flowers that are dark orange with a short yellow-orange flared tip and purple filamentts. Well-adapted to the Gulf Coast, this plant is foliage hardy down to 25-30°F and root hardy to at least 15°F. In Zone 9 this plant will grow as an evergreen shrub up to 4 to 5 feet tall and wide, but it will be smaller in areas where frost or freezes occur. 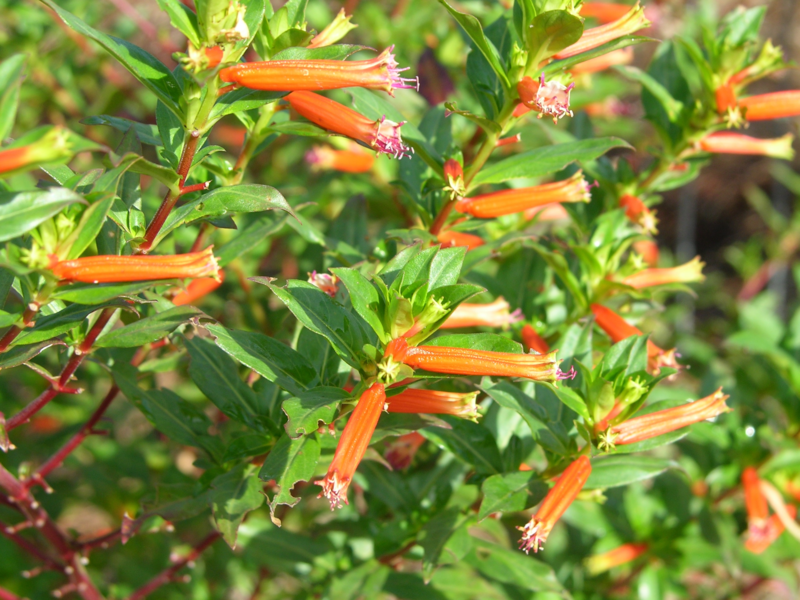 This selection is believed to be a hybrid between Cuphea ignea and C. micropetala that was given in the mid 1970s to David Verity, then the manager of the UCLA Mildred Mathias Botanic Garden. It was subsequently named for him when later brought into commercial production. 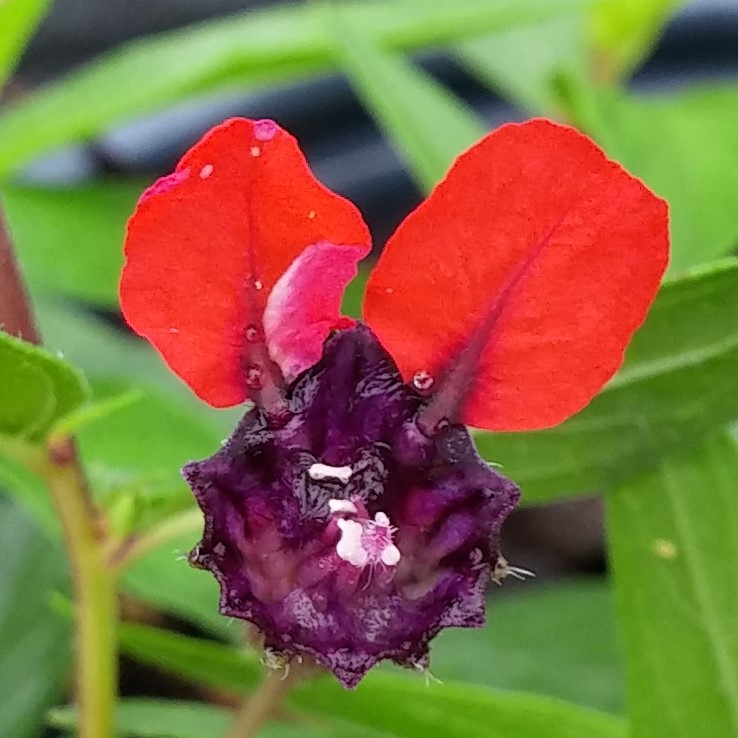 This new hybrid appears to be a superior cuphea because it grows as a naturally compact plant that produces more flowers than other selections. ‘Vermillionaire®’ grows about 24 inches or more tall and wide with a compact, mounding habit. 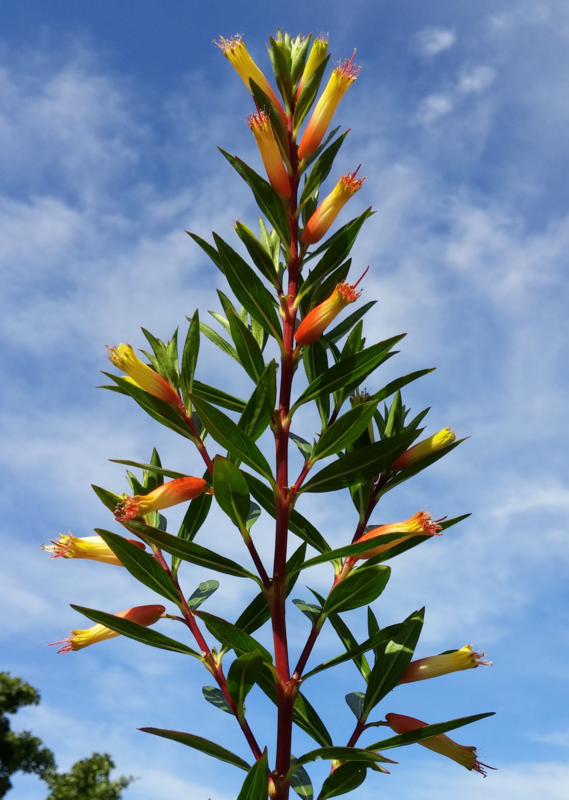 Orange tubular flowers are produced continuously until late fall. This cuphea is too new to know the full extent of its hardiness, but it is expected to be a perennial in Zones 8 and higher. Unlike the previous cupheas, this plant has small purple flowers, and some selections sport white flowers. Another difference is Mexican heather’s finely textured, bright green leaves. Gulf Coast Zone 8 plants are usually killed to the ground in winter, often recovering by summer but resulting in a compact plant growing less than 24 inches tall and wide. In Zones 9 and higher, Mexican heather is a larger-growing semi-evergreen tropical shrub. Reported pests are leaf-chewing beetles (Altica and Colaspis spp.) and the twig-dwelling lesser snow scale (Pinnaspis strachani). Mexican heather works well for edging beds or sidewalks, helping to define and soften pathways. Cultivars include Allyson, Lavender Lace, Purple Nurple™ and the white-flowered Monga (Itsy Bitsy° White) and ‘White Whispers’. Each 1-inch flower consists of a purple tube lipped with two red, upright lobes. By viewing the flower with its tip facing you, it takes only a little imagination to see the two red lobes resemble large “ears” above the purple “face” of a bat, hence the name. Along the Gulf Coast, bat face cuphea grows mound-shaped 8 to 24 inches tall and wide, depending upon the selection. It is very heat and drought tolerant but requires better drainage than the other cupheas. Bat face cuphea is evergreen down to the upper 20s°F and root hardy into the lower 20s°F. Improved forms of bat face cuphea include the cultivars, Flamenco Samba, Georgia Scarlet, Mellow Yellow, Miss Priss, Tiny Mice®, Sriracha™ Pink, Sriracha™ Violet, Torpedo, Vienco° Lavender and Vienco° Red.